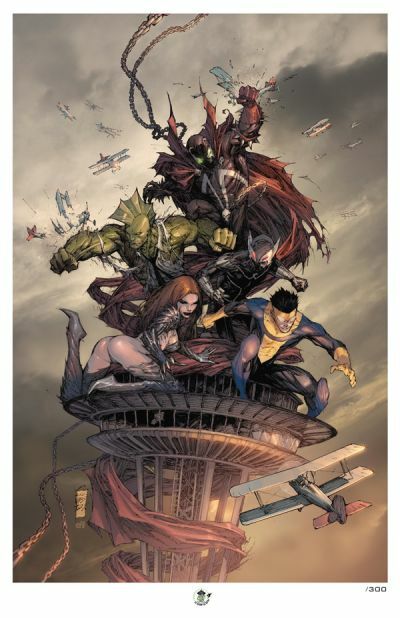 Emerald City Comicon (ECCC) is celebrating its tenth anniversary in 2012, and Image Comics, commemorating its twentieth anniversary, is hitting the fan-favorite Northwestern convention in a big way. Previously announced was the programming guide cover and exclusive poster and T-shirt art by Marc Silvestri. 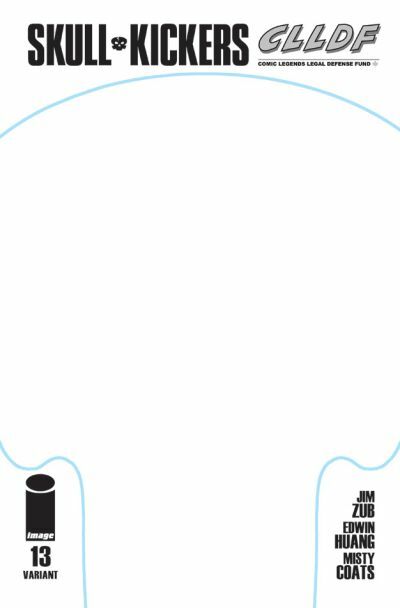 Now, in advance of the March 30-April 1 convention, taking place at Seattle’s Washington State Convention Center, Image Comics is announcing a trove of convention-exclusive covers, posters, prints, and T-shirts for some of their hottest titles. 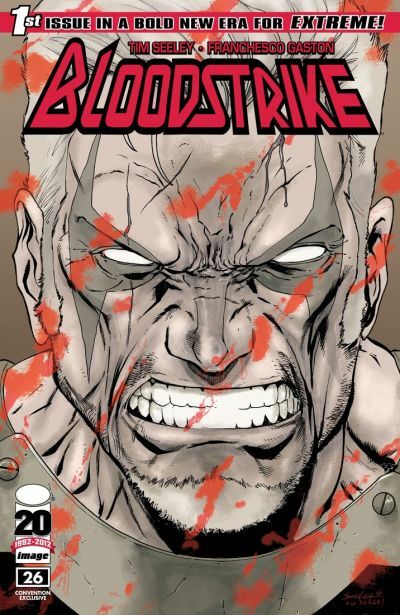 A blood-smeared variant cover of BLOODSTRIKE #26, the relaunch of Rob Liefeld’s Extreme title by Tim Seeley and Franchesco Gaston, pays homage to BLOODSTRIKE #1. The cover of the 1993 debut of the series invited readers to “RUB THE BLOOD!” This ECCC exclusive will be at the Image Comics booth, #310 for $5.00. 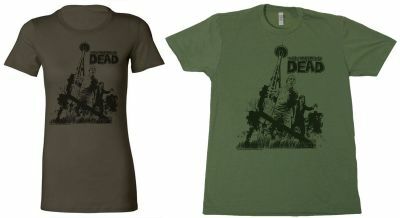 THE WALKING DEAD ECCC-exclusive T-Shirt will be the shirt to be seen in to show off your love of the undead, featuring an illustration by TWD artist Charlie Adlard. The T-shirt will be available in men’s and women’s sizes for only $20.00 at the ECCC show booth, #514. 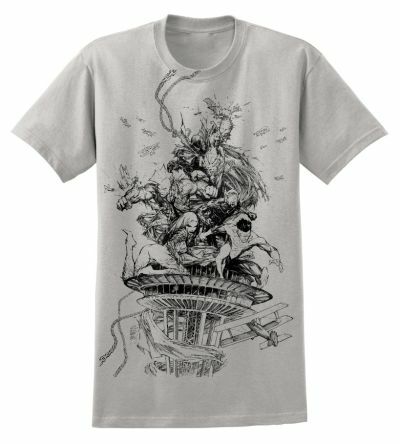 The ECCC booth will also have the exclusive Marc Silvestri IMAGE HEROES T-shirt featuring the line art of the image that graces ECCC’s program guide. The unisex T-shirt is $20.00. The print featuring the full-color Silvestri art will be at the Top Cow booth, #414. The 11” x 17” print is limited to 300 copies and is $20.00. An exclusive THE DARKNESS signed print by Jeremy Haun will be at booth #514 for $20.00. 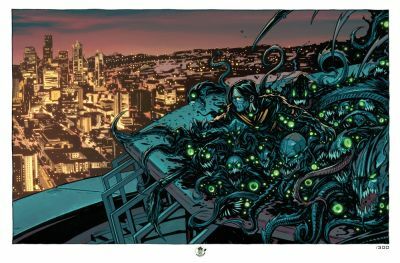 The 11” x 17” print is limited to 300 copies depicts Jackie Estacado, in the tendrils of The Darkness, atop the Seattle Space Needle, looking at the nighttime cityscape below. 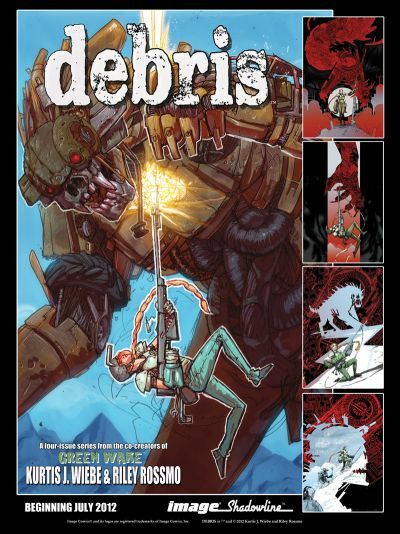 DEBRIS is a new Image Comics/Shadowline series by Kurtis Wiebe (Peter Panzerfaust, Green Wake) and Riley Rossmo (Rebel Blood, Green Wake) set to debut in July. 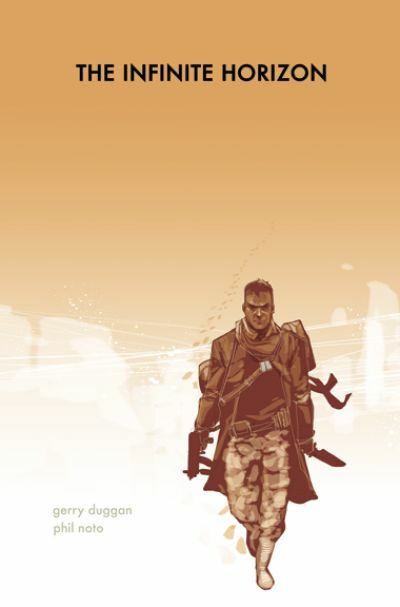 ECCC attendees will get an advance look at it as Image unveils an exclusive free poster at booth #310. 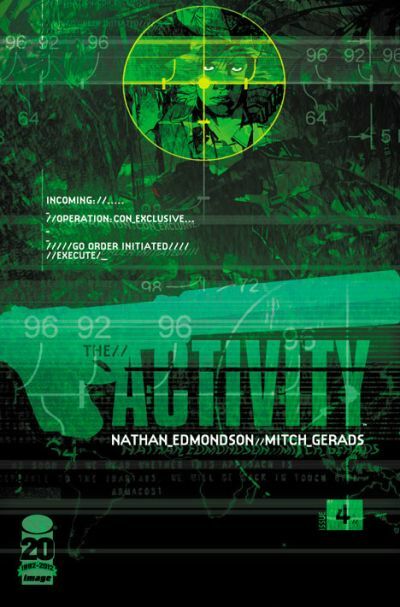 A night vision variant cover of THE ACTIVITY #4, the espionage series by Nathan Edmondson and Mitch Gerads, will be available at table #C-09 for $10.00. The elite Team Omaha takes on a drug lord in this issue of the cinematic series praised for its accuracy in its depiction of special ops missions, a great jumping-on point for new readers. An exclusive hardcover edition of Gerry Duggan’s and Phil Noto’s retelling of The Odyssey, THE INFINITE HORIZON will be at table #P-03 for $20. The near-future interpretation of Homer’s ancient epic is 186 pages long and not in stores until April 11, so attendees of ECCC will get an early chance to get the eagerly-awaited collection. The third SKULLKICKERS adventure begins with issue #13, and ECCC is the first chance for readers to see it! A limited number of Comic Legends Legal Defense Fund sketch cover variant editions of SKULLKICKERS #13 will be available at table #C-11 for $10.00 before the regular issue even reaches stores. 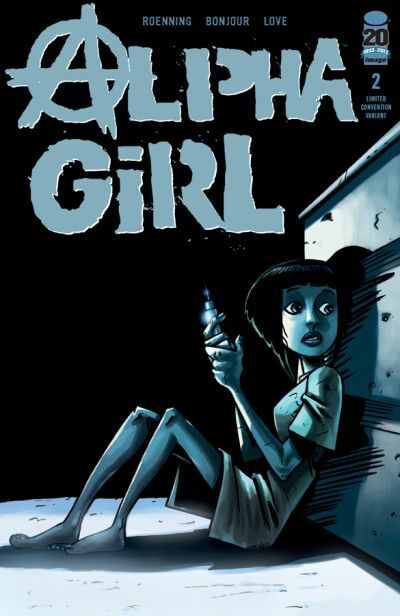 In addition to these ECCC exclusives, Image will also debut the convention-exclusive ALPHA GIRL #2 cover. The first issue of the series by Jean-Paul Bonjour, Jeff Roenning, Robert Love, Dana Shukartsi, and Diego Simone sold out, and the second issue will be in stores on the Wednesday before the convention, March 28. The issue will be available at the Image booth, #310, for $5.00.